To write about a 35 year old artist is a risky business. One might see promise, even flashes of brilliance, but you can’t be sure of not betting on a one-race horse. But Tony Nsofor is not run-of-the-mill artist. 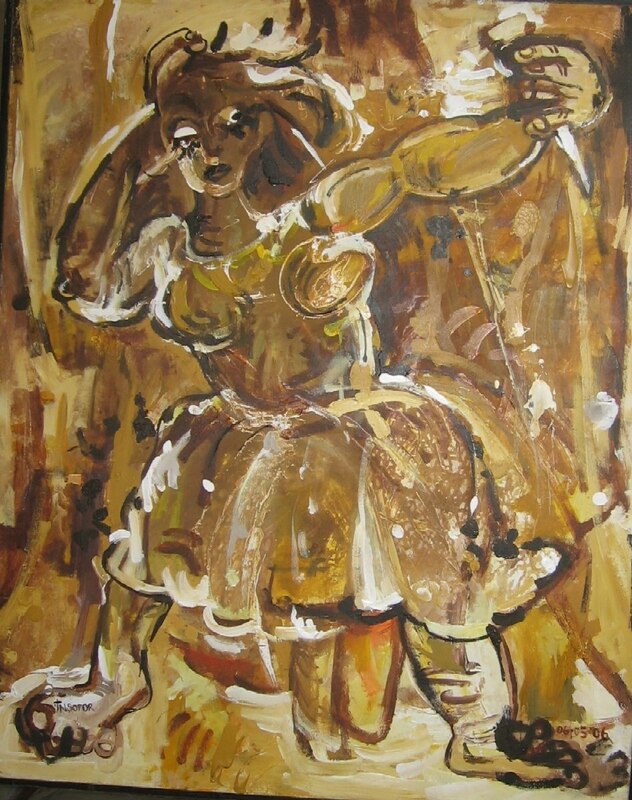 He studied Fine Arts at Nsukka and started working within the Uli tradition, but for years his works have shared few of the common features of so called ulism. 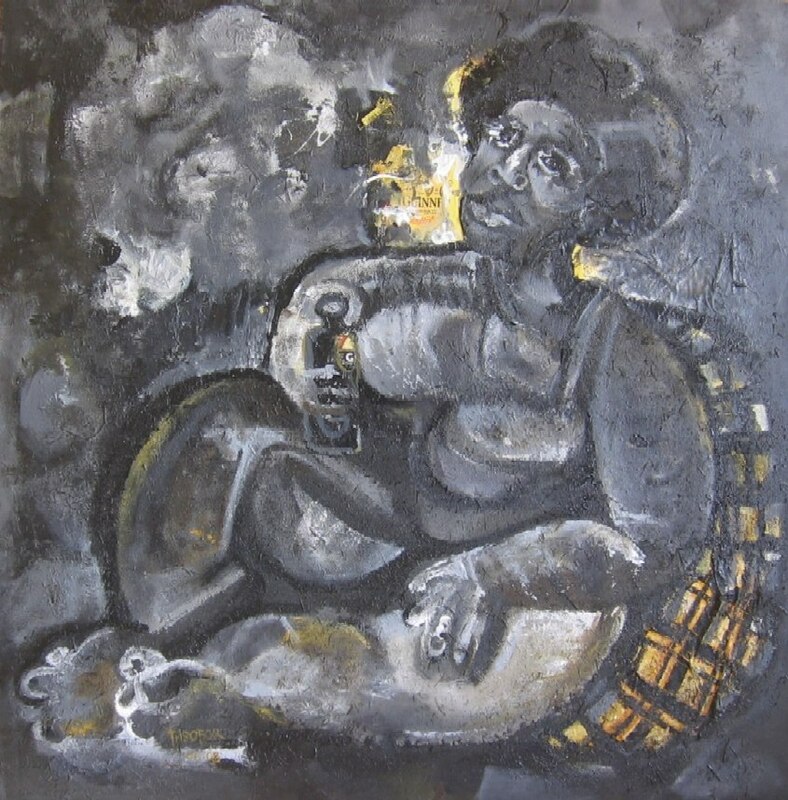 Among his contemporaries at the School there are some artists already known in the Nigerian artworld: George Odoh, Nkechi Nwosu-Igbo, Ozioma Onuzulike, Uche Edochie, Marcia Kure, Chika Aneke, Ike Francis, Joseph Eze, Blaise G. Gbaden, Chike Obeagu. Nevertheless, few of them are as independent as he is, and as the years pass he seems to be defining more and more clearly his own identity. Because of the strong distinctiveness of Nsukka Art School artists from there need to be brave and self-assured to challenge its nt artistic discourse and to propose an alternative one. Eleven years since he graduated, Nsofor little by little is finding its way. Nsofor is an “intense” painter, more instinctive and emotional than cerebral. His art is not for the mind, but for the eye and the heart. For a period, his paintings were like a palimpsest of paint dabs, lines and colour patches. 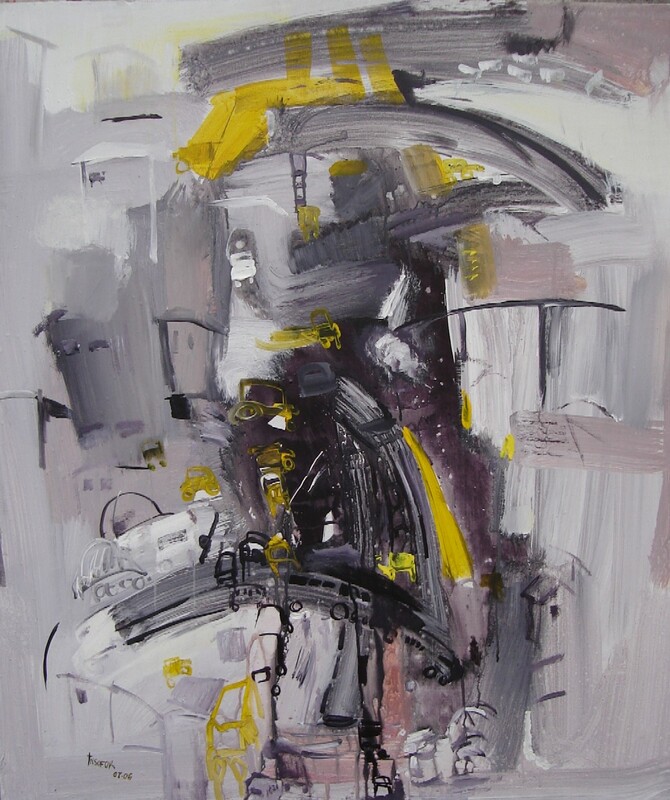 Improvisations that convey a feeling of incompleteness, as if some parts were missing. Other times they look uncompleted, as if they had been abandoned midway. Perhaps for this reason, the quality of his paintings is uneven. On occasion his works disintegrate into formlessness and they become little more than a spinning, unsettling amalgamation of brushstrokes. Perhaps this can be explained by his acknowledgement of Basquiat as a significant influence on his works. Of the works I have seen, there are four that, in my opinion, deserve special attention: Jael, Heber’s wife (2006), Oshodi II (2006), The visa queue (2007) and The stout woman (2008). Jael, Heber’s wife is a remarkable painting, and not the only one of Nsofor’s works based on a seemingly remote event. This refers to the biblical story of how Jael kills Sisera, the army commander of Canaan. When Sisera was resting in Jael’s tent “she took a tent peg and with a hammer drove it into Sisera’s temple till it went down into the ground”. It is extraordinary that Nsofor should take such a bizarre event as the subject matter of one of his best works. But what makes this painting noteworthy is the way in which Nsofor composes the figure on the canvas and the manner in which he uses colour. The fierceness of the scene is matched by the aggressive brushstrokes applied in a frenzy and then, balanced by a limited palette of tawny browns, ochers and yellows with a few daubs of white. This is a surprisingly mature work for an artist of his age. 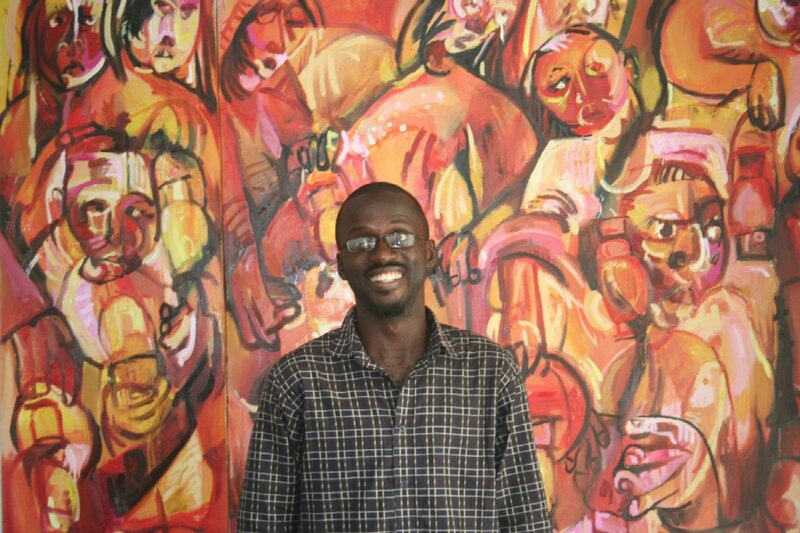 Oshodi II, belongs to a series of paintings he did in 2006 of the notorious Lagos traffic intersection. Here he uses very broad brushes and he applies the acrylic paint on a diluted manner that results in a great transparency of colour. Again, in this case his palette is limited: a gamut of grays from white to black plus a few daubs of bright yellow (a reference to the ubiquitous yellow buses). This painting is elusive, difficult to apprehend, but its largeness of gesture gives it a freshness and spontaneity not frequently seen among Nigerian contemporary artists. The formal strategy in The visa queue is different. In this large painting he starts from a black background, as if to emphasize the drabness of the scene: people waiting endlessly in front of a foreign embassy to get a visa. 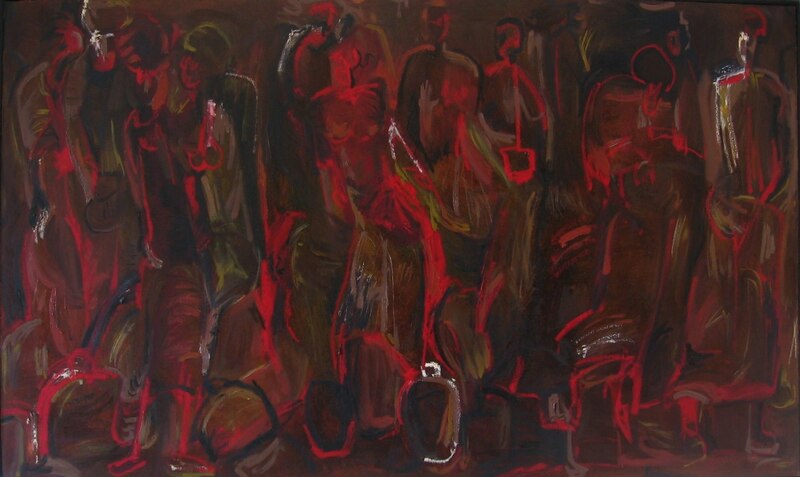 The few red lines on the dark canvas are enough to evoke unambiguous feelings in the viewer. Evocation seems to be enough for Nsofor, and the figures, loosely executed, become barely recognizable but full of strength. Finally, The stout woman, a very recent work whose title is a pun on the size of the woman and the bottle of stout she is drinking. Besides the introduction of irony and playfulness –something that contrasts with the stern character of most of his previous production- Nsofor is attempting something new in this painting. The texture of the painted surface has changed by mixing the pigment with granular additives and also by adding a piece of real cloth. This is a subtle, understated work, made more so by the use of greys, only broken by a few yellow patches. Degas, the great French painter, said that he wanted to be “illustrious and unknown”. He achieved both aims: he played a central role in the development of modern art, while remaining a very private man. Nsofor has so far succeeded on the second account: he is scarcely known outside a small circle of connoisseurs and friends and his name rarely appear in lists of contemporary Nigerian artists. Maybe, it is too early to say it, but I think he has what it takes to succeed also on the first aim. Time will tell, but perhaps an illustrious artist is already quietly working among us and not too many has taken notice. Posted on July 8, 2008 March 5, 2012 by Jess CastellotePosted in ArtistsTagged Nsofor. Jess, I hardly read long blog posts but yours is an exception… I can’t stop reading till the end. Your expose on Nsofor is brilliant to say the least (if an art layman like myself can make such a judgement 🙂 ) Anyhow, I will be one of those looking out for Nsofor and his works on the Nigerian art scene. Well done! My warmest feliciation to Tony Nsofor. Just thinking alound, this country have many budding Tony Nsofor’s, the issue is that their stars remain unsong and they dim away unappreciated. Many thanks Jess for searching out young promising talents like Nsofor and bringing them to limelight. Anyway, I think i need more ‘education’ to better appreciate Nsofor’s art. Wow!..your review is quite cool with lots of depth. 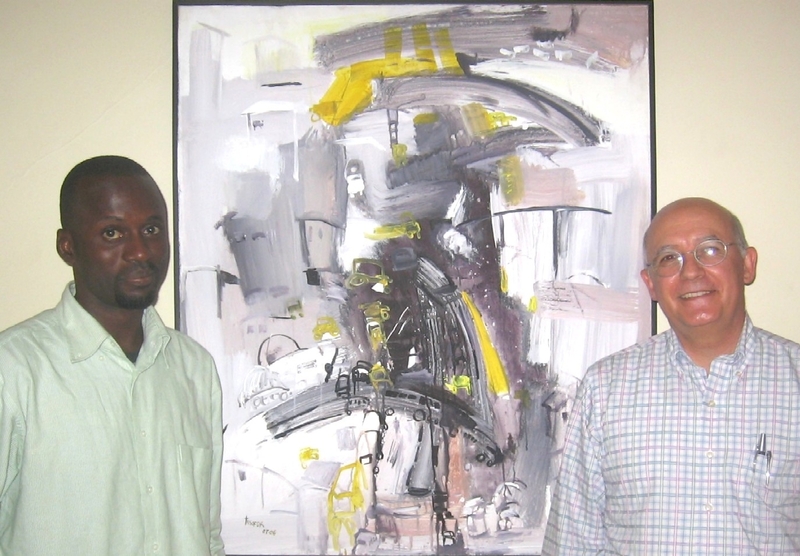 Jess, Tony is one of those with whom we shared experiences in Nsukka while we were still being groomed by Obiora Udechukwu in the painting studio. We held private sessions scrutising our works and admiring each others progress. Today’s success story started a long time ago…Nsukka provided fertile ground for any serious artist to grow. Years after that era i still look back with nostalgia not to go over it differently but to deliver similar inspiration to the students of art i am now grooming. It is a difficult task. hey, Oshodi II is MINE!!! !